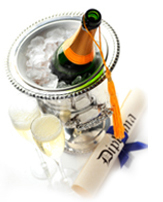 Celebrating a graduation, the Grand Valley Inn is the perfect place for your family and friends to join you for this special event. Our private rooms will be set up to your seating specifications and the Grand Valley Inn can set your decorations up for you. Just drop them off and we will do the rest. Seasonal centerpieces are always set on the tables unless you choose not to use them. Just let us know your needs and we will take care of the rest.